I suffer from a little known, debilitating condition—‘PPA,’ parallel parking anxiety. Randy, my instructor from New Canaan’s Lewis School of Driving, diagnosed the affliction in 1990. To this day, should a spot open up on Elm Street that requires parallel parking, I white-knuckle the steering wheel and give myself a pep talk. I will never effortlessly glide into a parallel spot—especially when judgemental outdoor diners have front-row seats to my humiliation. If only I had a hologram-like Obi-Wan Kenobi version of Randy to calm me, I’d probably get past my parking issues. As reported over the summer, Elm Street recently lost 15 premium parking spots. 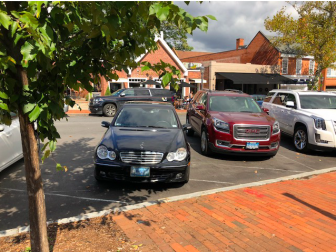 However, if you’re honest with yourself, maybe 11 spots were actually taken away: Consider the lousy parking jobs (mine included) occuring on a daily basis in New Canaan that eat up spaces. A handful of the skinny spots along Elm were never truly usable, as cars routinely cross the lines and invade neighboring ones. Some local drivers interpret spaces as a general suggestion on where to center a their vehicle. I am also guilty of driving a car that was simply impossible to park, and so I wreaked havoc for eight years in my blindspot-ridden vehicle. Regularly after pulling into a space, I had to exit the car and take a “boots on the ground” approach to visually assess the allowances on either side of my tires. After a full analysis, I would jump back in and do another sub-par job of finding the equidistance between the two lines. Though I tried my best the spot often got the best of me. Fortunately, I now drive a car equipped with a 360-degree camera, plus a satellite feed that gives me a God’s-eye-view of my parking sins. If that weren’t enough, my current car can park itself. Since I’m not a quitter, I cannot bring myself to activate said feature and have the car outshine me. I will not 100 percent surrender to the conveniences of modern technology—I’m more comfortable around 90 percent. Plus, I am “building character” by facing my parking anxieties, and public scrutiny, whenever I exercise my right to parallel park abhorrently along Elm Street. And when you think you have seen it all, some yahoo comes along and does the unthinkable, like parking in the middle of a crosswalk or ditching their car wherever they deem suitable. The-rules-do-not-apply-to-me mentality is an epidemic and it is getting under the skin of New Canaanites. One hotspot for acquiring visuals that spur on social media unrest is the Starbucks parking lot. A few incensed members of the group have identified chronic and alarming parking infractions—most of which revolve around the handicapped parking space that is often misused by able-bodied, parking-challenged coffee addicts. Also pointed out are drivers parking the wrong direction on the one-way Elm Street, or simply abandoning a car in the middle of the road (or a stranger’s driveway) without even attempting to find a legitimate spot. I have to say, these social media vigilantes often make a good point: Who does these things? I know that we are all busy and that the parking situation in town is spotty, but we cannot abandon common sense and common decency. Yes, my driving and parking skills are not always top notch, but it is not for a lack of trying. And, I shall never, ever park in a handicapped spot. OK, yes, I once dragged my 92-year-old grandmother to a ballet recital to ensure premium handicap parking, but she did enjoy the show and had the proper paperwork to use said space. But, never again. There is a special place in not-Heaven for people who abuse handicap access. So beware, New Canaanites, people are watching. They are taking photos and posting insane parking snafus on social media. Some may believe it’s public shaming, but I say don’t park or drive like an entitled moron and all will be fine. Should you see my license plate plastered on social media, it’s only because my skills are not entirely five-star. But I assure you that I am not parking in a handicapped spot (ever again) or ditching my car in phantom parking spaces. My issues are purely due to a lack of skill, and I can take them up with Randy. Best article EVER. Sadly the dopes that park like dopes will continue to do what they do bad. We will all continue to get a pic and posting that picture with license plate included for our own little pleasures. Park on everyone. As the admin and creator of said snarky group, I could not be prouder! We aren’t really “public shaming” as much as having a good laugh at the audacity of some self-entitled community members. Also? If you feel shame, you have issues, own your mistakes and laugh at yourself. I am sure one day my bad parking job will show up, and I will definitely have a good laugh at myself! Great article – nice job!